Where is the Miner’s Guild? The Mining Guild is located in Ul’dah, and is Headed by Adelberta, who is pictured above. Just started gathering? you might want to read our Gathering General Guide / FAQ first. Miner Gathering Map: Where to find mining nodes? Mining Node Locations Guide . Pretty useful if you need to grind or find something specific. What Crafting Classes Benefit Most From Mining? Please note that almost every crafting class needs items from both miners and botanists(and monsters). The above recommendations are the classes which depend more heavily on mining. 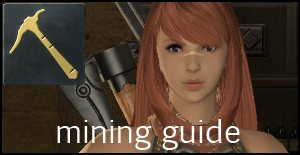 Check our Mining Leveling Guide. Find out what and where you can find Mining Quest items, Mining Levequests, Nodes unlocked per level, and more! A vast majority of Mining skills and traits are exactly the same as Botanist’s. They only affect different types of nodes (Mineral Deposits and Rocky Outcrops for Mining). The only exceptions are the three level 20 skills. In the case of Mining, these skills affect the gathering of lightning, fire and water shards/crystals/clusters. 1 Prospect Survey the landscape to locate mineral deposits and rocky outcrops. 53 Impulsive Appraisal Appraise a gathering node for collectables. Increases item rarity by perception x0.9. Increases item wear by 10. Uses one gathering attempt. 30% chance Discerning Eye activates. They still haven’t updated the levels yet… misinformation abounds. Yes this is quite an old guide. The other miner resources are much more recent. IE, leveling guide, BiS, etc. “Mining traits and skills are exactly the same as botanist traits and skills.” This doesn’t help at all. Truth of Mountains skill is gained at level 46, Toil of the Mountaineer is gained at level 50.